Lagos – To protect children from polio infection, the Lagos State Government has said it is targeting no fewer than 4.9 million children between 0-59 months, irrespective of their immunisation status, for free vaccine which began on Saturday, at various designated centers across the state. According to World Health Organisation(WHO), Poliomyelitis (polio) is a highly infectious viral disease, which mainly affects young children. The virus is transmitted by person-to-person spread mainly through the faecal-oral route or, less frequently, by a common vehicle (e.g. contaminated water or food) and multiplies in the intestine, from where it can invade the nervous system and can cause paralysis. Initial symptoms of polio include fever, fatigue, headache, vomiting, stiffness in the neck, and pain in the limbs. In a small proportion of cases, the disease causes paralysis, which is often permanent. There is no cure for polio, it can only be prevented by immunisation. Speaking at the flagging off of the National Immunisation Plus Days (NIPDs) at Shomolu Local Government Secretariat, Lagos, the special adviser to the Governor on primary health care Dr Olufemi Onanuga said the government was aiming to increase the total number of children who receive Oral Polio Vaccine in the state, as this would boost their immunity. Noting that the state government was particularly interested in the health of children, Onanuga stressed that the goal is to ensure that they enjoy good health services. Onanuga also said the government had embarked on massive media campaigns as the NIPDs would involve house-to-house, transit and fixed post operations between the hours of 8am and 2pm daily for four days. Onanuga further assured on the level of preparedness for the campaign at a flag-off ceremony to signal the commencement of the campaign at Agege Local Government Secretariat. He said, “The NIPDs would involve house-to-house, transit and fixed post teams. In all, Lagos State will mount 752 fixed posts, 4859 house-to-house and 1712 transit teams, children at home, markets, churches, mosques, major car parks and social events venues would be specifically targeted”, he said. Onanuga added that plans have been made to implement activities that would attract children and care givers to vaccination posts stressing that the vaccination campaign will hold between the hours of 8am and 2pm daily for four days. He further observed that the goal of the State government is to increase the number of children between zero and 59 months who receive two drops of oral polio vaccine irrespective of their previous immunisation status. The Special Adviser stressed that this will boost children’s immunity against poliomyelitis. He explained, “To ensure the success of this year’s polio vaccination campaign, many training sessions have been conducted to strengthen the capacity of relevant health workers. 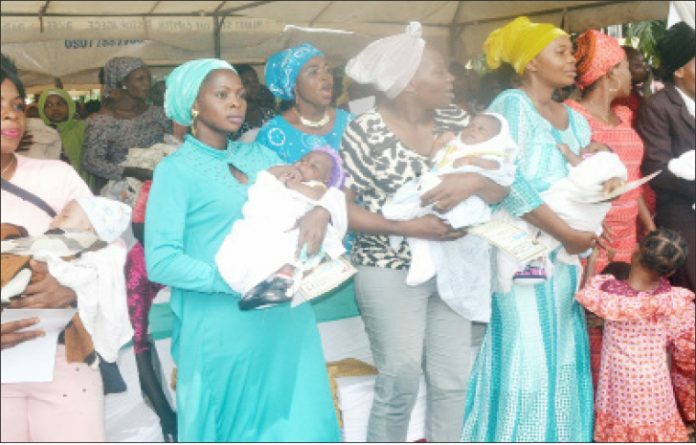 Nursing Mothers and their babies at a Flag-Off Ceremony to signal commencement of second round 2018 National Immunisation Plus Days at Agege weekend. Onanuga stressed that town announcements; community dialogues; mosque and church announcements; sensitizations with schools; and advocacy meetings with LGA Chairmen, Ward Councillors, Supervisory Councillors for Health, and key traditional and religious leaders have been and are being carried out. While appealing to parent and caregiver to ensure that all the children in Lagos between 0 months and 59 months received two oral drops of polio vaccine during this campaign, the Special Adviser stated the vaccination service is free. He also said, the vaccine is safe and effective, and is to be administered to the children irrespective of their previous immunisation status. While emphasising that the immunization is free, effective and safe with little gifts as incentives for immunised children, he enjoined parents and caregivers to take advantage of the campaign to boost the immunity of their children by immunising their wards at government designated centers across the state. Onanuga who noted that the responsibility to vaccinate all eligible children against measles is not that of the parents and care givers alone added that the responsibility rests on everybody to ensure that children are fully immunized against childhood preventable diseases. “The State government is particularly interested in the health of the children and as such is prepared to carry out any activity that will ensure that their right to health is attained. Polio is one of the major killer diseases of children under the age of five years which can be prevented by vaccination”, the Special Adviser posited.